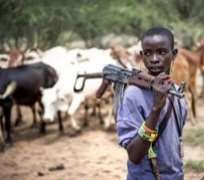 Despite Military Exercise Ayem Akpatuma in place in Benue State, herdsmen have allegedly sacked over 5,000 residents of Mbatoho community in Mballagh Council Ward of Makurdi Local Government Area of Benue state capital from their homes. Community spokesman John Tehemen disclosed this when he led some members of the community on Tuesday to notify State Governor Samuel Ortom about the development at Government House in Makurdi. He disclosed that the herdsmen invaded the community located on an island, forcing inhabitants of the area out of their homes. “There are over 5,000 people in the community. The herdsmen who were fully armed with sophisticated weapons early hours of [Monday] stormed our Mbatoho community and ordered everyone to leave. The herdsmen came in their numbers, burnt down our houses, barns and farmlands. They did not however harm anyone; they only asked us to leave,” said the leader. Receiving the people on behalf of the Governor, Deputy Governor, Benson Abounu, who stated that government was just hearing about the invasion, promised that government would promptly intervene in the matter; adding that he had ordered the security adviser, Paul Hemba, to liaise with the police to visit the area and investigate the situation. When asked whether the state government was not worried that herdsmen might use the place as a launching pad for further attacks on the state capital, Abounu posited that government would work on the information received so far to ascertain the true story before it would decide on the next line of action.